Wow! What a cool pattern, and super fun colors – I couldn’t wait to hang it! 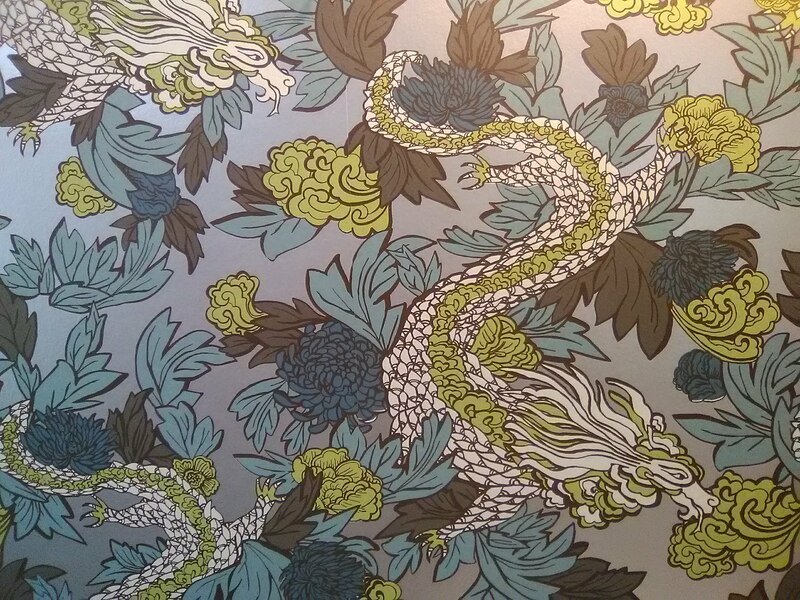 This wild dragon and flora wallpaper on a silver metallic background went in a largish powder room in a new townhome in the north Heights neighborhood of Houston. The single guy homeowner went through a maddening number of choices before finally settling on this one. Boy, is it a great one! The paper was a little testy to work with, though. 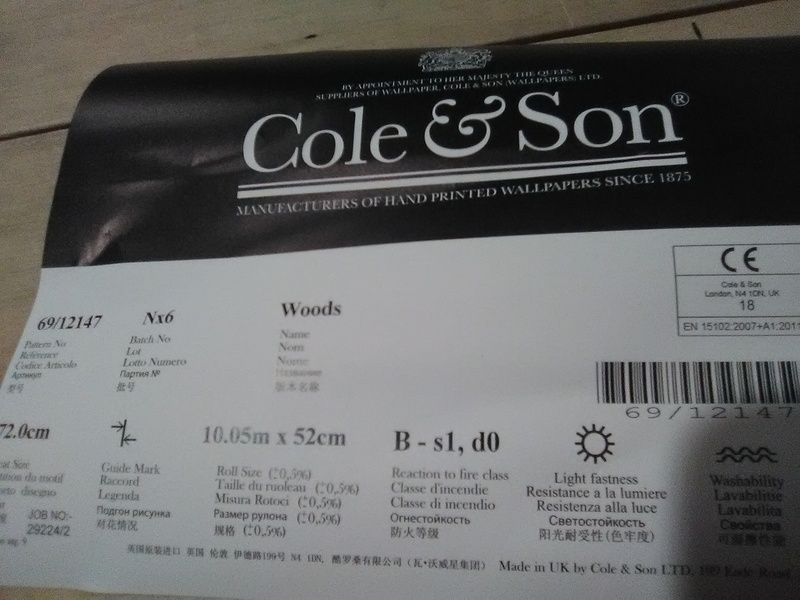 It is a thick and stiff and somewhat spongy non-woven material which was difficult to manipulate around features like the light fixture and the vanity top. In addition, the metallic surface was very prone to creasing. 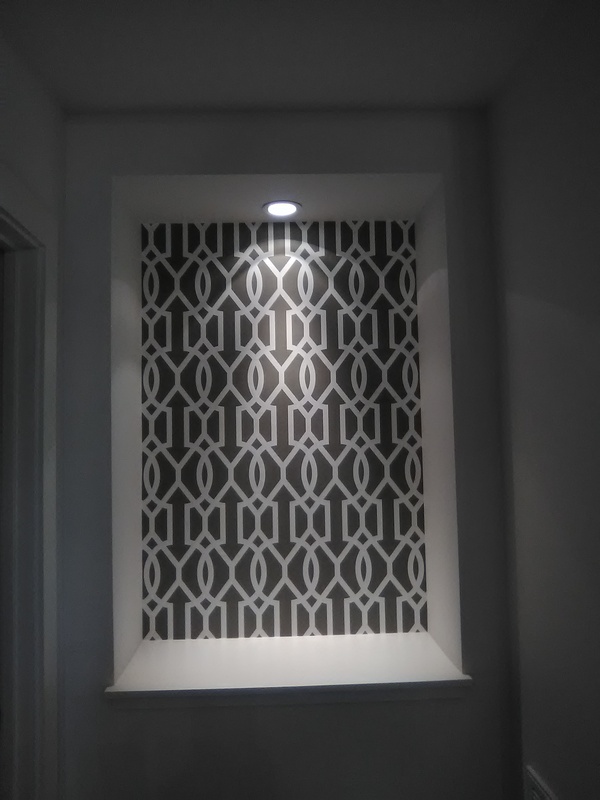 The wall-mounted light fixture could not be removed, and I knew that working the paper around it would result in visible creases. 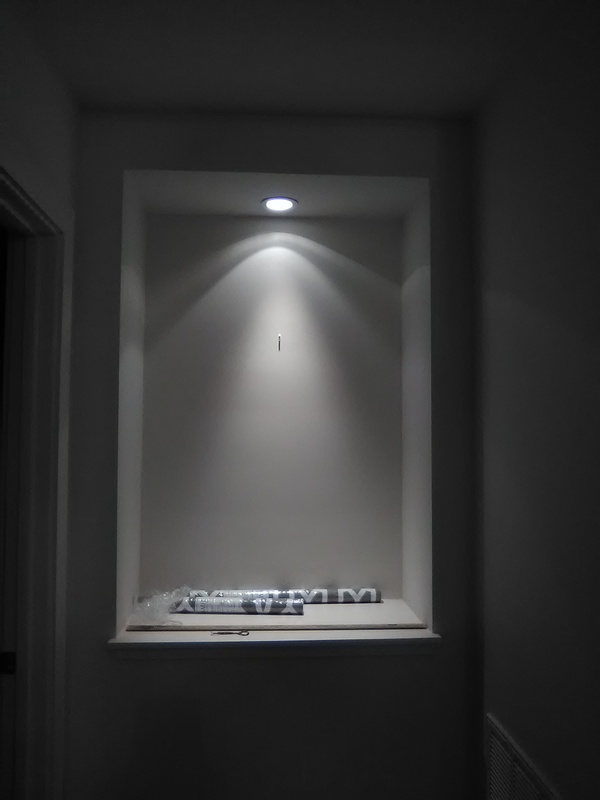 My solution was to split the strip horizontally right where it would land on the light fixture. 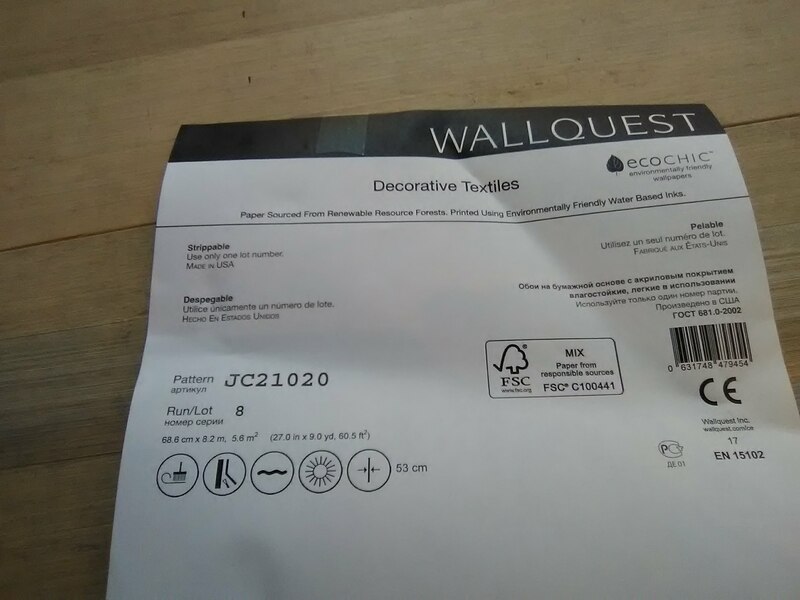 This made it easier for me to make relief cuts and to ease the wallpaper around the fixture. I used similar techniques in other areas of the room. The paper is a lot more vivid and colorful than the photos show. All that teal and chartreuse and silver, and the relentless swirling tails and scales and leaves combine to make one mesmerizing room! A mirror with a wide, dark brown frame set it off. 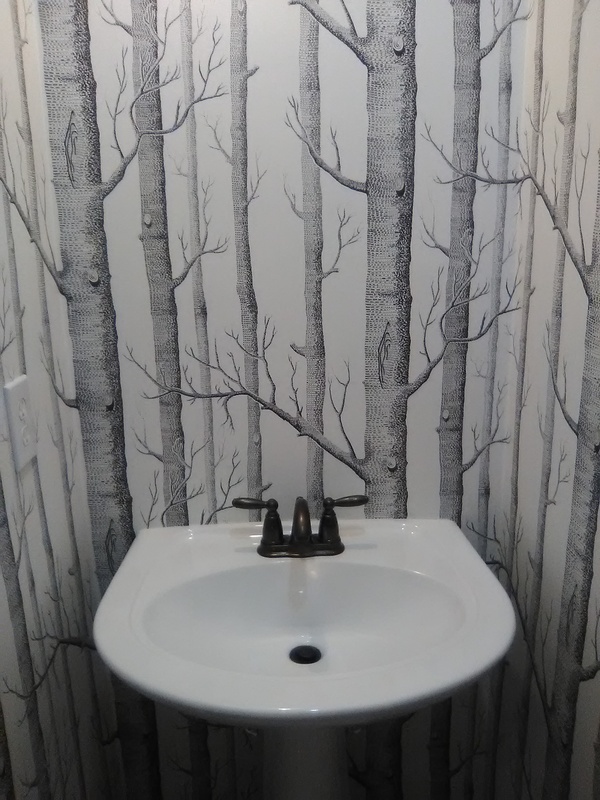 This wallpaper pattern is by York, in their Dwell Studios line, and was bought from my favorite source for good quality, product knowledge, expert service, and competitive price – Dorota Hartwig at Southwestern Paint on Bissonnet near Kirby. (713) 520-6262 or dorotasouthwestern@hotmail.com. She is great at helping you find just the perfect paper! Discuss your project and make an appointment before heading over to see her. 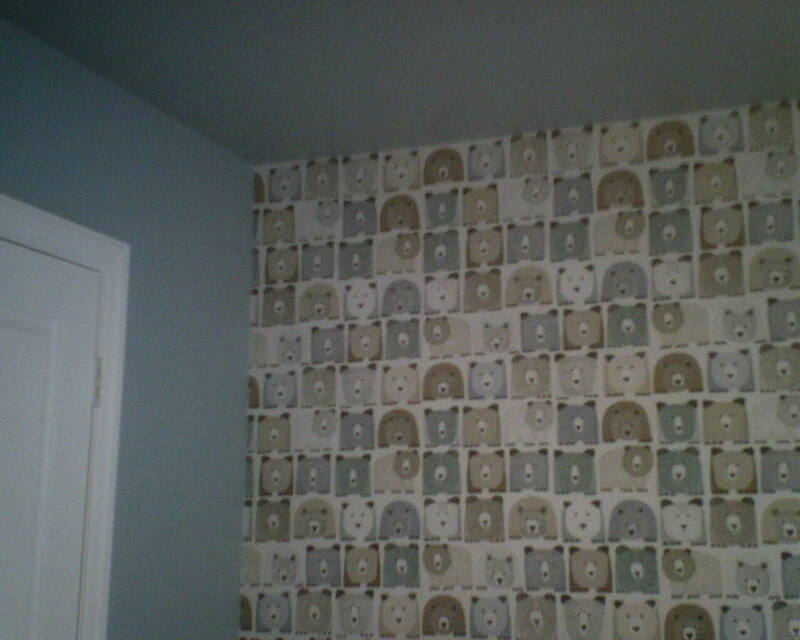 Today I was to hang this cute bear wallpaper on one accent wall of a baby’s nursery. The walls were 0ff-plumb, and the ceiling was not level, and the pattern was very plotted and symmetrical. So let’s just say that the room presented challenges. 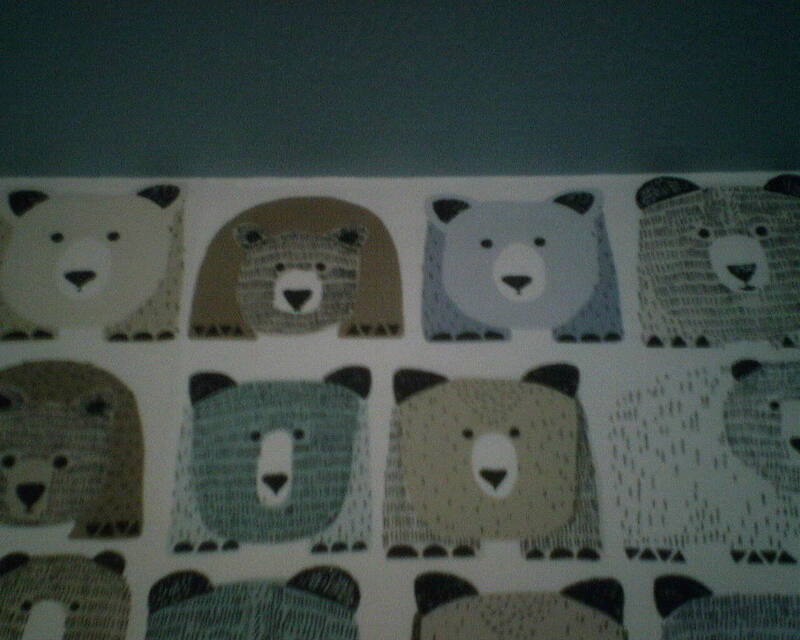 One thing that helped was the way the blocks of bears are printed on the wallpaper. See Photo 1. Unlike most wallpaper designs, the motifs did not cross the seams, so there were no elements to be matched from strip to strip. This left me free to place the bears’ heads at the top of the wall with every strip. 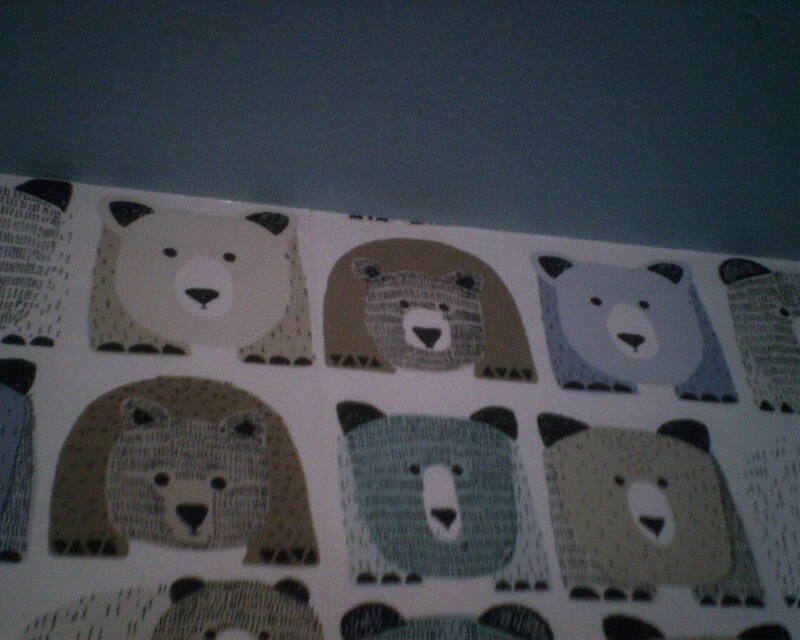 Normally, when the ceiling is not level, the wallpaper pattern (the heads of the bears) would start to move up or down the ceiling, and that means that the heads would start to get chopped off horizontally. 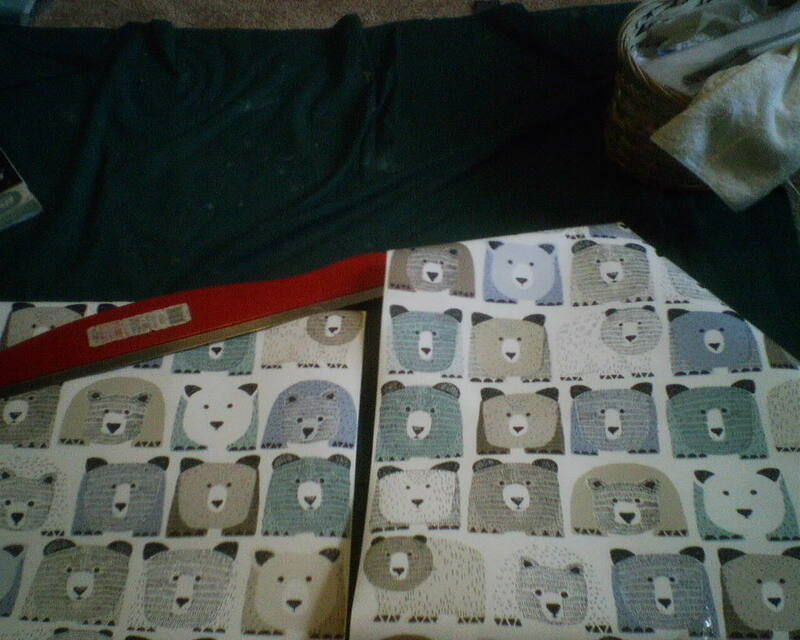 But since this pattern did not cross the seams of the wallpaper and I didn’t have to match any parts of bears across the seams, I was able to pull each strip up to the top of the wall, and eating a uniform line (or head-count 🙂 ) at the top of the wall. It meant that the lines of bears were not perfectly level from strip to strip – but that was not very noticeable, and was a whole lot better than seeing heads get chopped off. 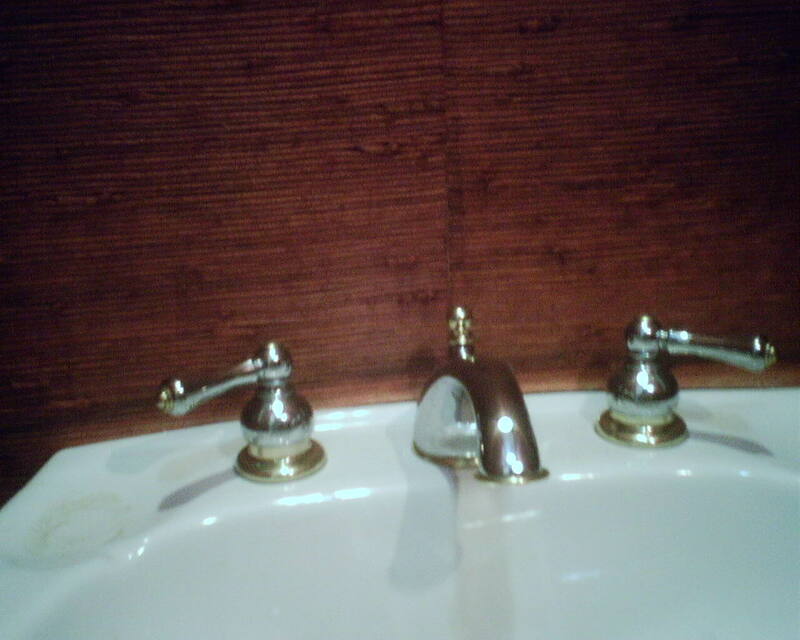 The walls on either side were also not plumb. 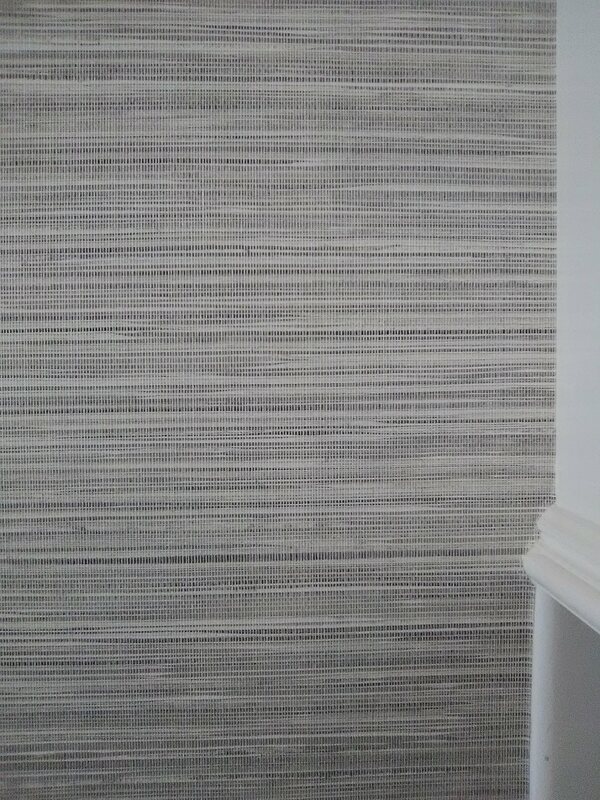 As a test, I hung the first strip of paper butted into the corner, so it is parallel with the wall. The second photo shows my laser level red line against the side of the paper. 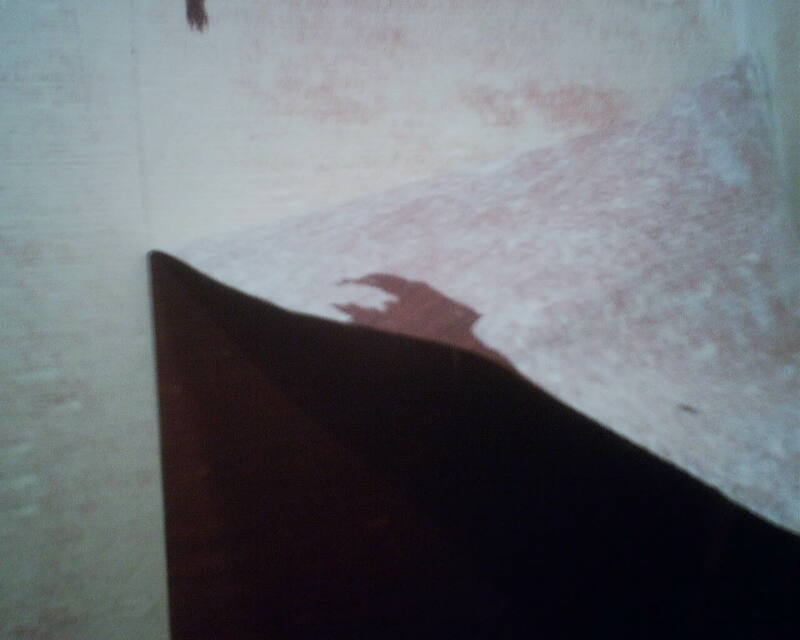 If you could see above the top of the photo, that red line is butted against the edge of the paper at the top of the wall. Yet as you move down the wall, the strip of wallpaper moves away to the left of the red level line. 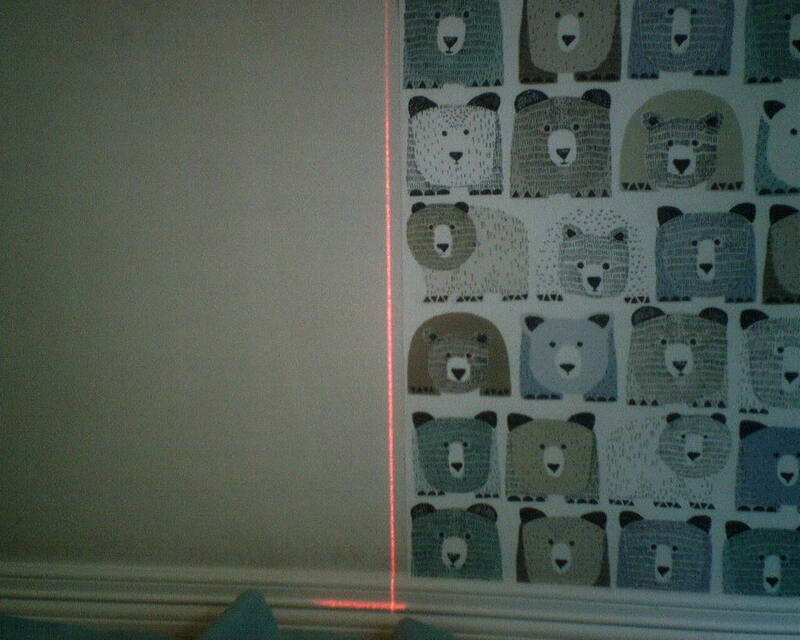 I could pull the strip of paper into plumb so that it aligned with the red laser line – but that would cause a slew of bears to get their heads sliced off vertically where they hit the adjacent wall. As well as when they got to the opposite wall. Also, since the ceiling was not level, the bears’ heads would start marching either up or down the ceiling line, and, again, some bears would get their heads chopped off. I checked for plumb on both outer walls, and found that both walls were off-plumb by a fairly significant amount. Luckily, both walls were out of plum parallel with one another. This meant that I could hang the paper off-plumb and butted into the right corner, and it would come out on the left side of the wall nicely parallel to the opposite side (right corner). 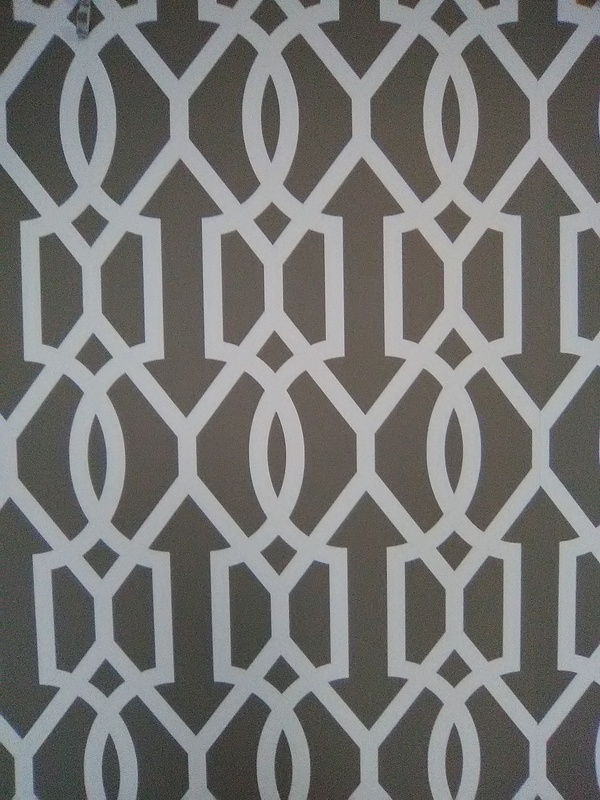 So the pattern aligned nicely with both the right and left walls. But since to do this I had to hang the paper off-plumb, it would also go off-level at the ceiling. And since the ceiling was already no where near level, it was very likely that the pattern was going to track up or down that ceiling line, with a bunch o’ bears getting their heads cut off. But because the ceiling was off-level by such a great degree, some of the pattern did get crooked, and so you see a couple of black feet starting to appear above the brown bear at the top of the wall (See photo 3). But I’d rather have a few paws showing at the top of the ceiling, than have a bunch ‘o bears get chopped off vertically at the corners. But still, I didn’t like looking at those paws hanging down from the ceiling. The fix was easy. I took some scrap wallpaper and from it I cut some thin strips of white paper that I then pasted over the offending paws. Voilà! No visible dangling paws. This is a new townhouse in the Cottage Grove neighborhood of Houston. 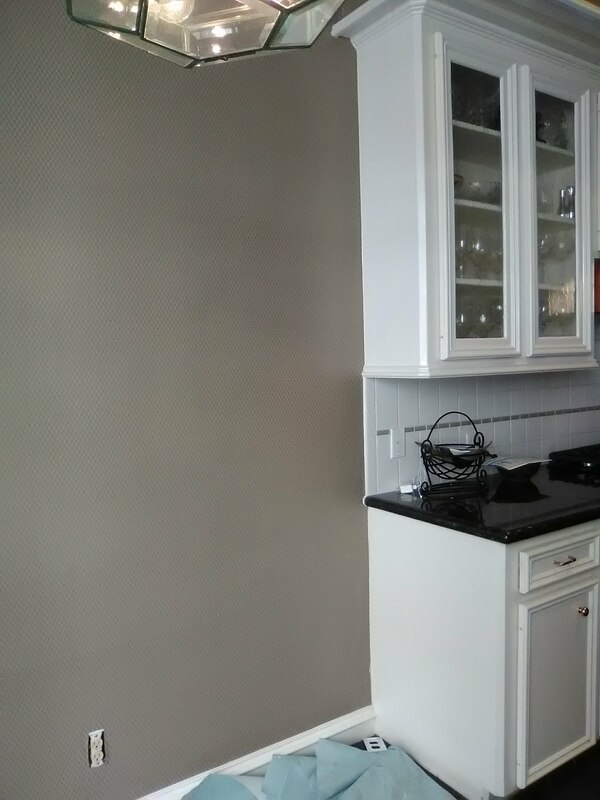 This breakfast and kitchen area in a 26-year old townhome in the Montrose neighborhood of Houston was originally papered with a very small print on a darkish brown background. It served its purpose for two decades, but the homeowners were ready for a change. They originally considered grasscloth, but after hearing my opinion on the real stuff (read “Grasscloth – Info Pack” page on the right), they opted for this fine faux material instead. I love this particular product because it uses vertical strings to create the textured feel that people like, as well as has a printed grass design in the background. 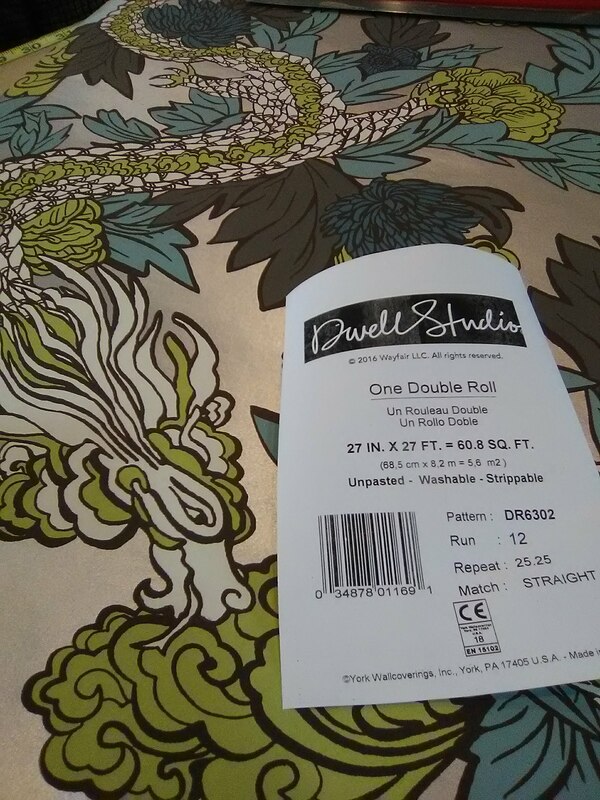 Because it’s machine-printed, the pattern can be matched, so there are no visible seams like with real grasscloth. There also is no paneling or shading (variations in color between strips, or even within strips, even when they come off the same bolt) that are common with real grasscloth. I have another couple using this same material in another month or so, in their entry. I do have to say that this time, there was one strip that did panel – it was a slightly different shade from the one next to it, even though it came off the same bolt. This was disappointing, because I promote this brand specifically because you do not expect that. Anyway, I always have people order enough that we can cover a situation like that, so there was plenty of paper to remove that strip and replace it with one with better color. 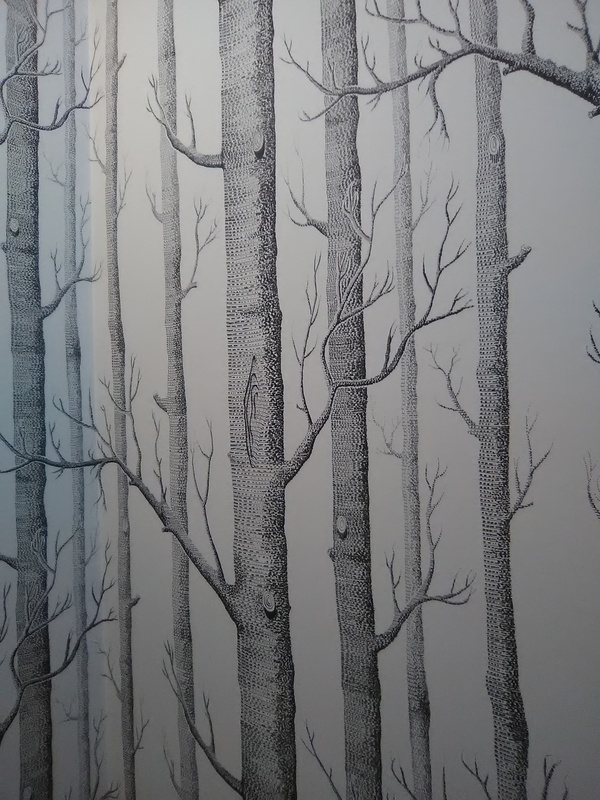 This wallpaper is by Walquest, in their Grass Effects book, in the Ecochic line. It was bought from my favorite source for good quality, product knowledge, expert service, and competitive price – Dorota Hartwig at Southwestern Paint on Bissonnet near Kirby. (713) 520-6262 or dorotasouthwestern@hotmail.com. She is great at helping you find just the perfect paper! Discuss your project and make an appointment before heading over to see her. When people first contact me, I send them an “info pack” that explains the wallpaper process and how I work. It has a lot of helpful and important information. One point is my time frame. 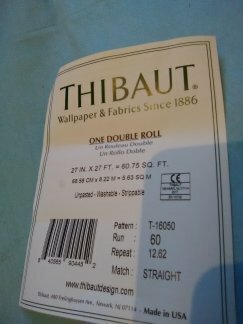 I am usually booked up 2-3 months, so most likely I will not be able to help homeowners who want to have their wallpaper up quickly. 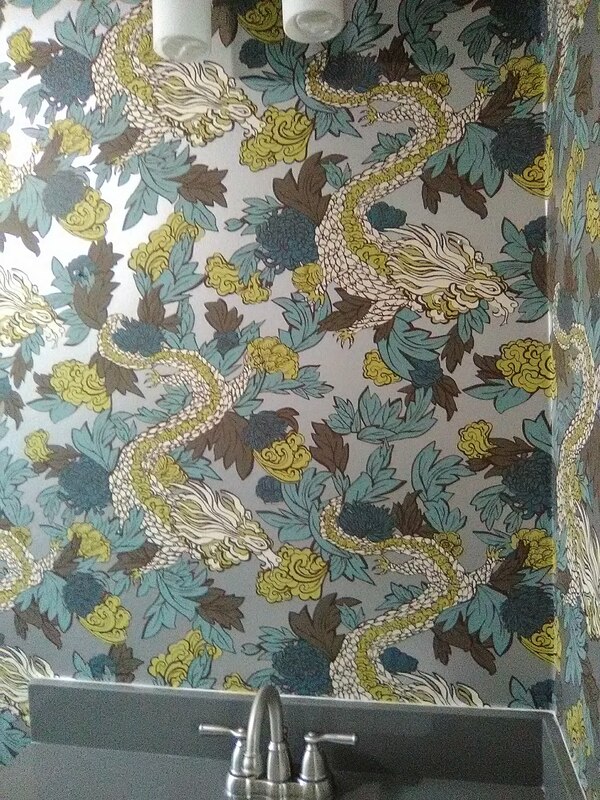 Another is that I don’t work on construction sites, but prefer to install the wallpaper after all the building is over and the other workmen are done and gone. There’s a sentence advising people that I work in private residences only – no businesses or commercial settings. I also don’t work in mid- or high-rise buildings, or many other multi-unit complexes like apartments or condos. Townhome compounds with shared driveways can be difficult, too. It has to do with multiple trips back and forth to the truck, and with hauling 50 pound buckets of paste along with bulky equipment like my 7′ long pasting table, and not blocking the neighbors access to their garages. If people would read the information I send them, they can often discern early in the game if their situation is one that I am a good match for. Medicine Cabinet? WHAT Medicine Cabinet? 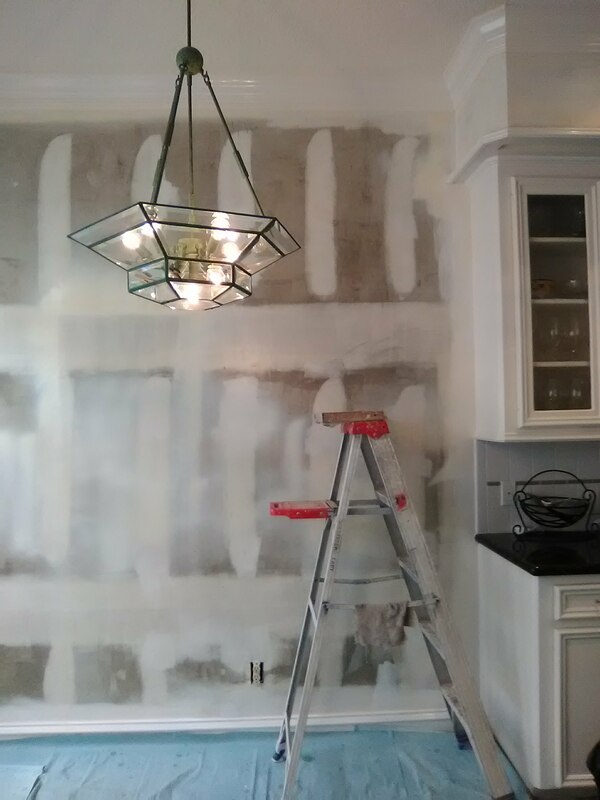 The homeowner of this new contemporary townhome in the Midtown neighborhood of Houston didn’t want the plywood medicine cabinet standing out like a big white blob against her beautiful new wallpaper. She thought that covering it with wallpaper would help it fade into the design, and be less obvious. She was right – the cabinet is much less noticeable now. 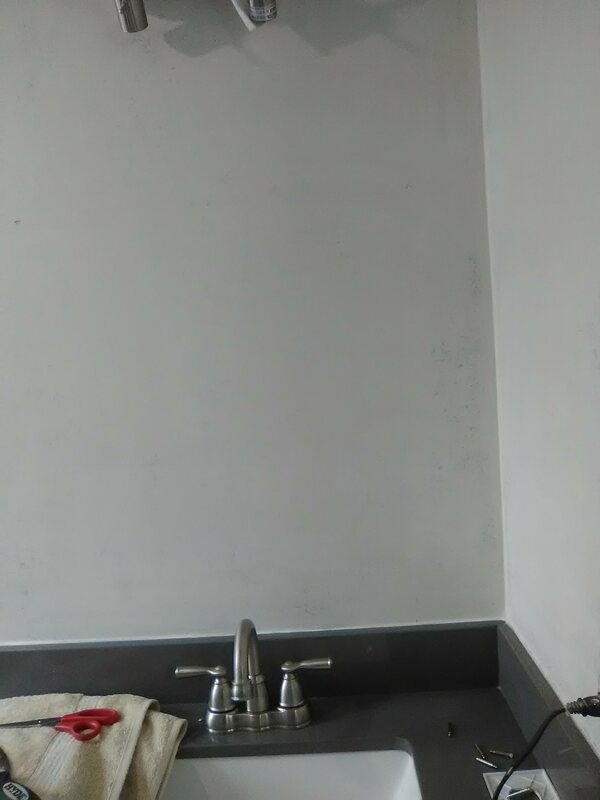 The cabinet is simple, but it still took about an hour to cover it with wallpaper. The wood had already been primed with KILZ, a stain blocker that will prevent any wood sap from bleeding through the wallpaper. 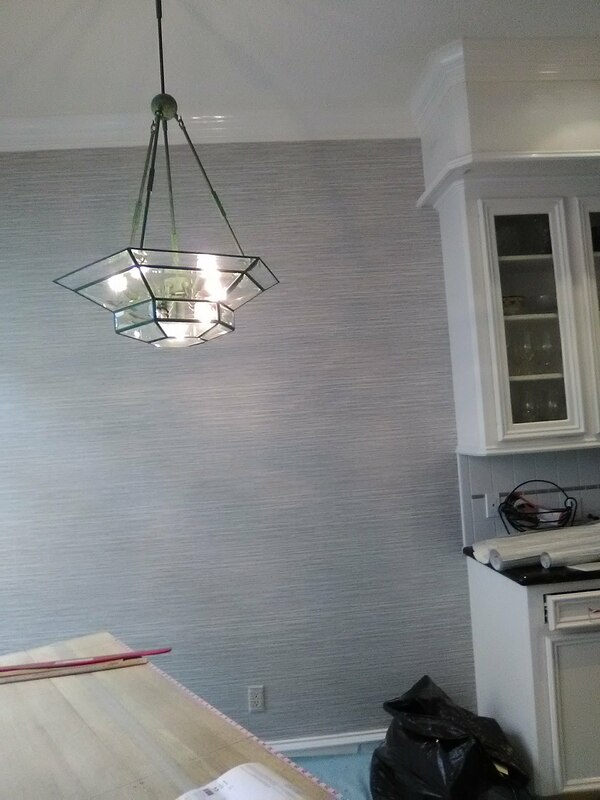 Then I applied a wallpaper primer. 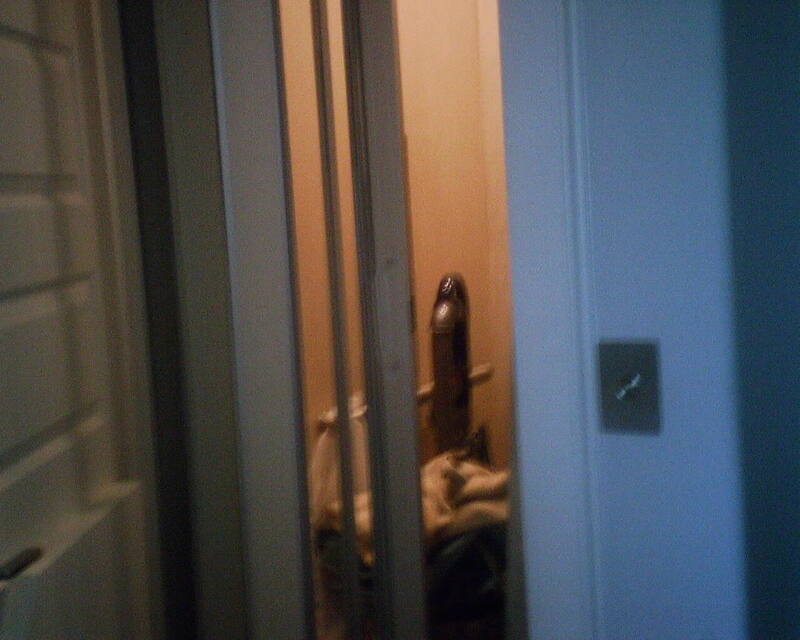 There is a seam down the middle of the door, so there is a total of four pieces of wallpaper (two on the frame and two on the door itself). The cabinet is seen more from the left side than from the front, so I lined the pattern up so it is continuous when seen from the left side. Wrapping the design around the 3/4″ thickness of the edge of the cabinet frame caused it to not line up with the pattern on the surrounding wall. No biggie in this case … The pattern is squiggly and irregular enough that a small mis-match of the design is not noticeable. 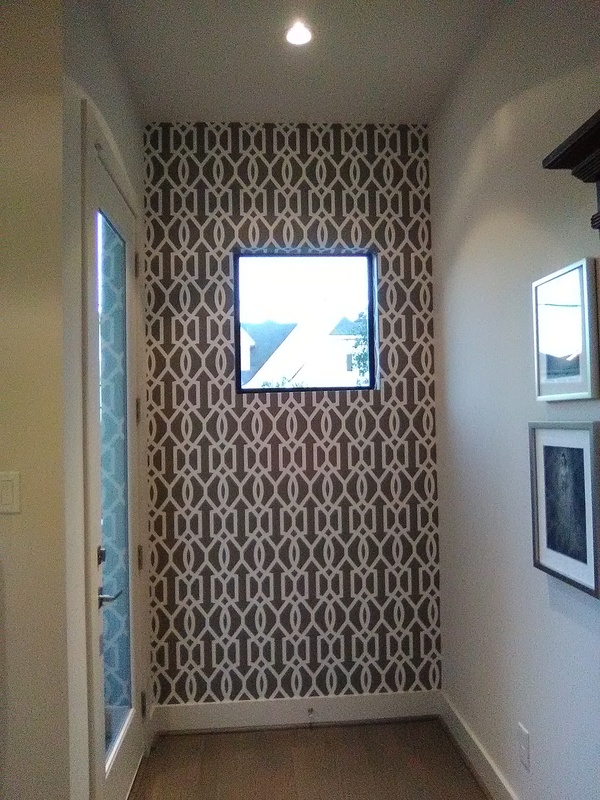 When I got to covering the actual door of the cabinet, I aligned the pieces so that the pattern would line up with the design on the frame, so that when you look at it straight-on (as from the toilet or shower), the pattern is visually intact. Again, even though the design does not line up perfectly with the design on the wall behind it, the slight mis-match is very minor. The pattern match is perfect from where it’s viewed from the left side, and it is perfect where it’s viewed from straight ahead. Win-Win! 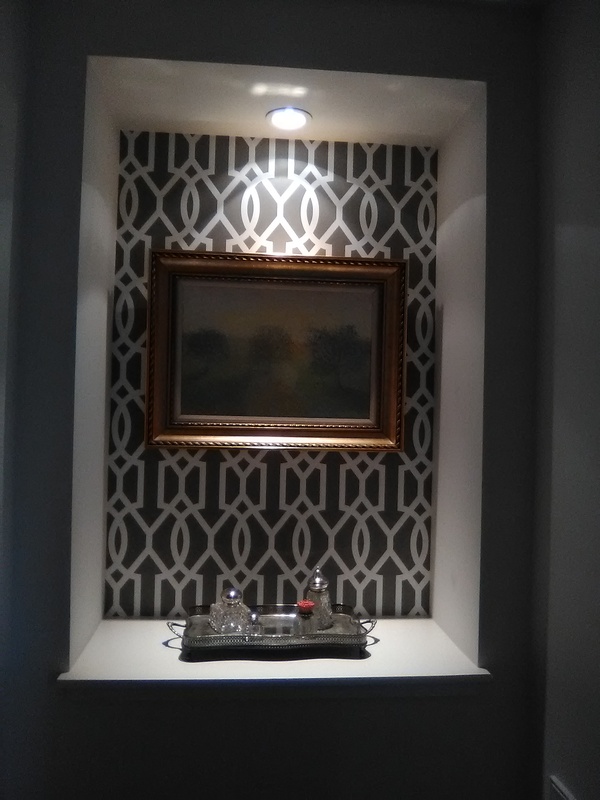 This wallpaper pattern is by York, in the Sure Strip line, and was bought at below retail price from Dorota Hartwig at Southwestern Paint on Bissonnet near Kirby. (713) 520-6262 or dorotasouthwestern@hotmail.com. She is great at helping you find just the perfect paper! Discuss your project and make an appointment before heading over to see her. This powder room in a newish townhome in the Galleria area of Houston was originally papered with a deep red, nubby-textured grasscloth wallpaper. It didn’t suit the taste of the new homeowners, so they had me strip it off and replace it with something lighter. Often, grasscloth can be really hard to get off, because the grass fibers and the netting used to sew them to the backing separate from the backing and come off in tiny handfuls of fiberous messiness. I was luckier today, because the top layer with the grass fibers and red ink came off the wall fairly easily, and in almost-intact 9′ strips. 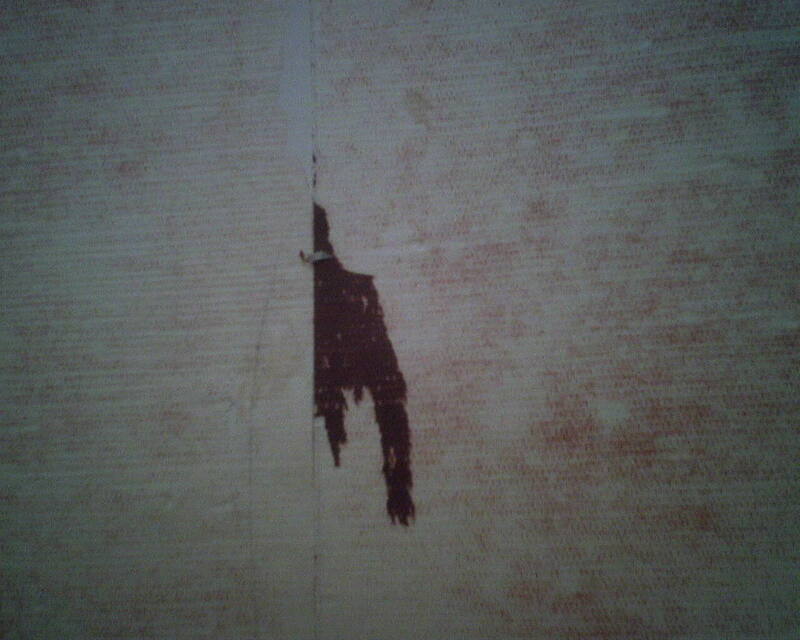 The paper backing was left on the wall (see 2nd photo). In some areas (see 3rd photo), bits of the red inked layer remained. The next step was to remove the paper backing. All that’s needed is to use a sponge to soak the backing with warm water. Soak one section, move on and soak the next, then go back and resoak the first section, etc. Water has a harder time penetrating the patches where the red inked layer was not removed. Soak it a little more, or use a putty knife to get under that layer and pull off the inked material. Eventually, the moisture from the warm water will reactivate the paste. 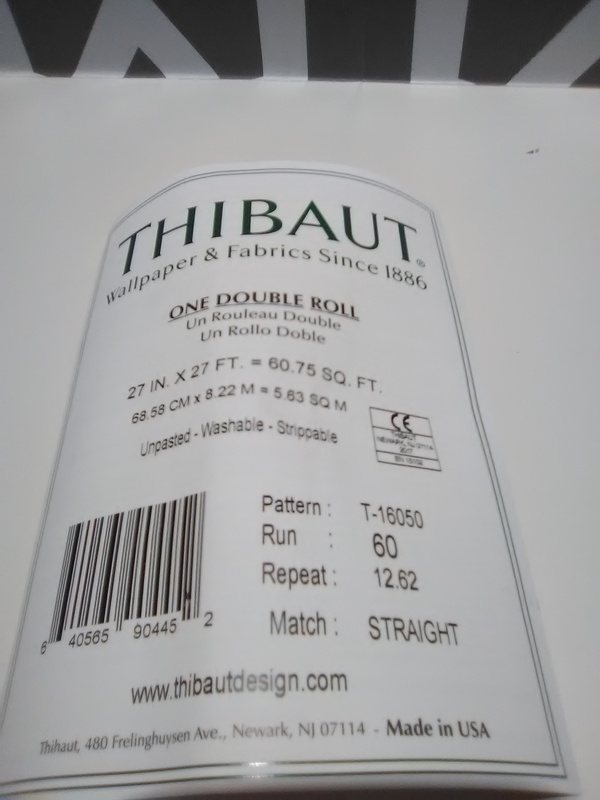 If you are lucky, you will be able to simply pull the paper backing away from the wall. 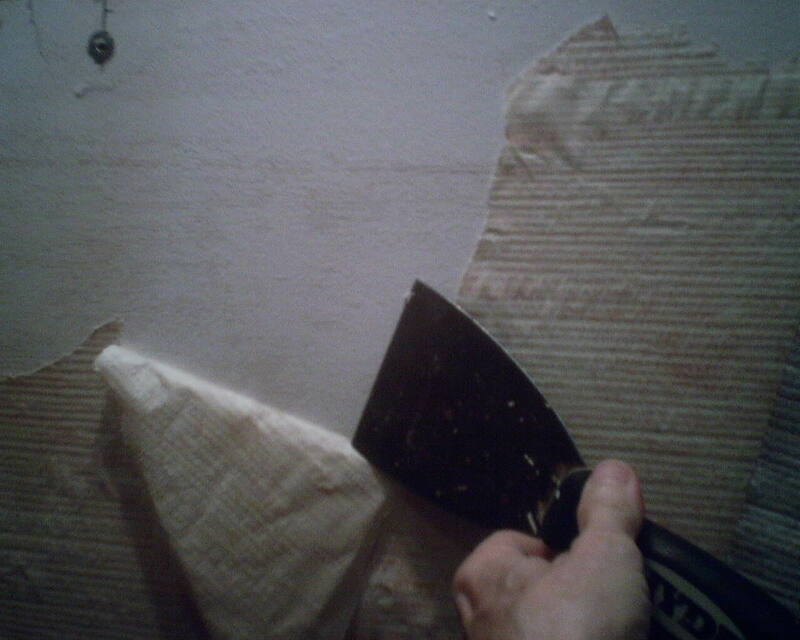 But if not, all it takes is a little elbow grease and a stiff 3″ putty knife, to gently scrape the paper from the wall. 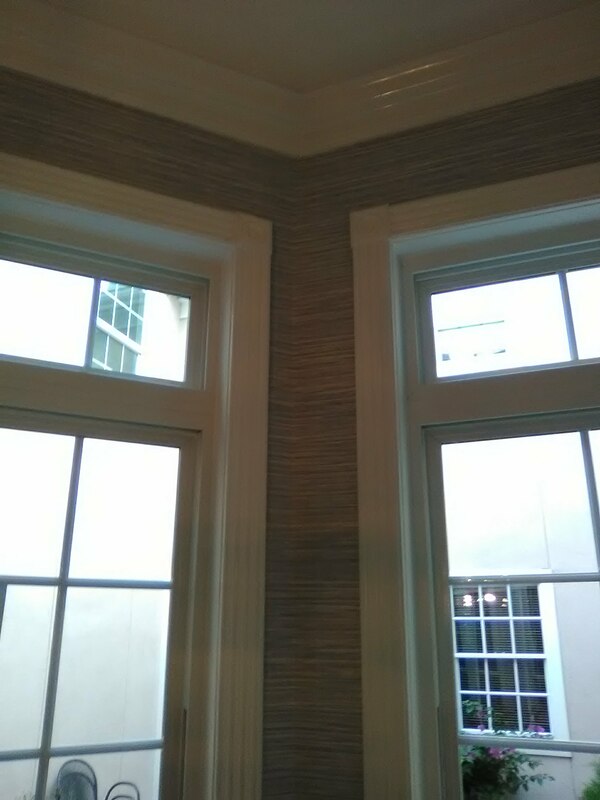 I was doubly lucky today, because whoever hung the original grasscloth did a good job, including the use of a good primer to seal the walls before he hung any wallpaper. His primer protected the walls, and all my water and tension as I soaked and pulled paper off the walls caused no damage to the subsurface. All I had to do to prepare the walls for new wallpaper was to wash off old paste residue, and apply a primer, in this case Gardz by Zinsser. 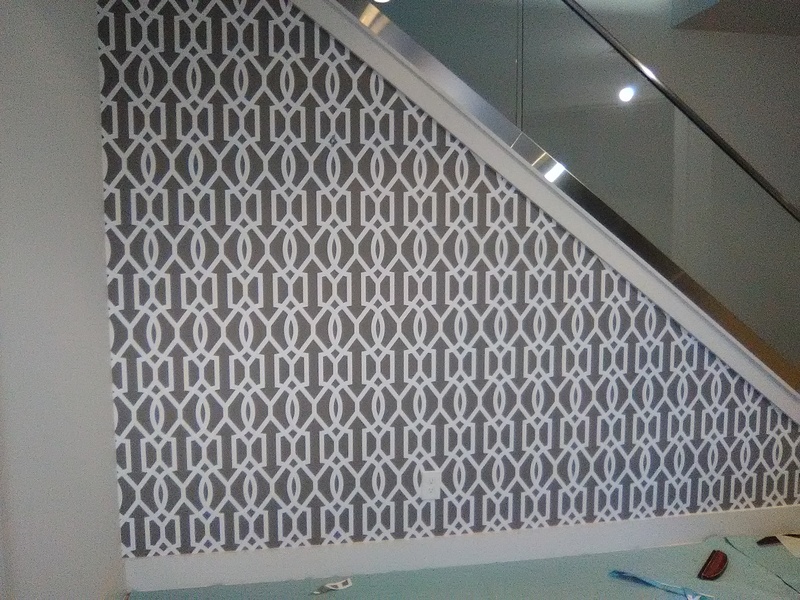 Today I was hanging wallpaper in a 4-story townhouse. I was not looking forward to lugging all my bulky and heavy gear (7′ long 30lb table, 40lb buckets of paste, loaded toolbox, and lots of assorted equipment) up and down all those stairs. Was I happy to see this in-home elevator! It sure made my day much easier.